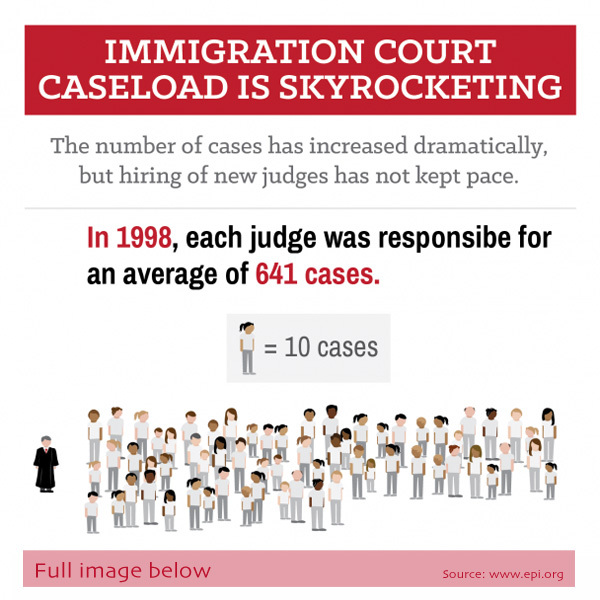 Nationwide, the number of cases in immigration court have risen, but the number of judges has not kept pace. As a result, each judge is responsible for more cases. 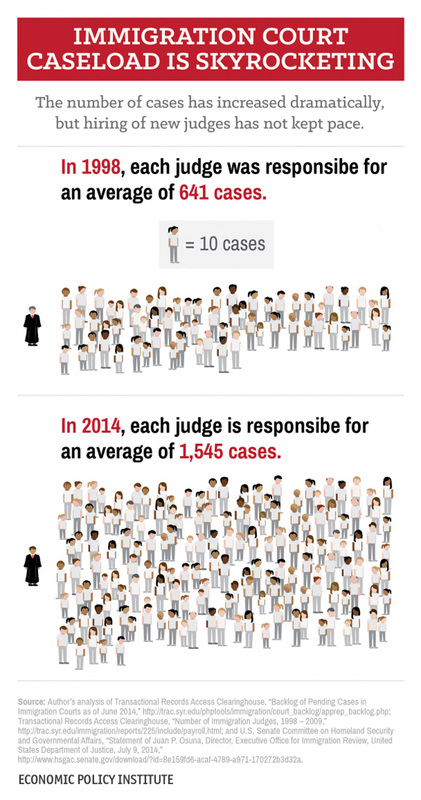 According to the Economic Policy Institute, each judge must oversee an average of 1,545 cases. Take a look at the graphic below from Economic Policy Insitute. A higher caseload means it takes longer for cases to come to completion. While the national average is 590 days, cases in Los Angeles take an average of 820 days (or close to 2.5 years). With the recent influx of cases from Central America, this is not going to get any easier for judges and it’s likely that cases will take even longer to resolve. If there is a way to have a case resolved outside of court, those options should be pursued. For example, the Department of Homeland Security may consider terminating a court case to allow a case to be completed with the immigration agency USCIS. In other instances, the Department of Homeland Security might agree to administratively close “low priority” cases. If there is an argument that the Department of Homeland Security has not met its burden of proof, that argument should be vigorously pursued so that the case can be dropped. However, if you have an immigration court case that can only be decided by an immigration judge, you should seek the assistance of a competent immigration attorney. If you would like to discuss your case in more detail, I invite you to contact me.